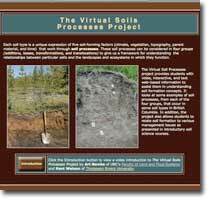 The VIRTUAL SOIL PROCESSES teaching tool was developed to illustrate the four general soil forming processes: additions, losses, translocations and transformations. The tool is used both as an in-class and off-campus resource in various natural resource courses, such as soil, agriculture, forestry, environmental sciences, or geology, across British Columbia and beyond. One of the principle goals of this project was to partner with experts from the various institutions and pool their knowledge in the creation of this unique learning resource that would be available to anyone.